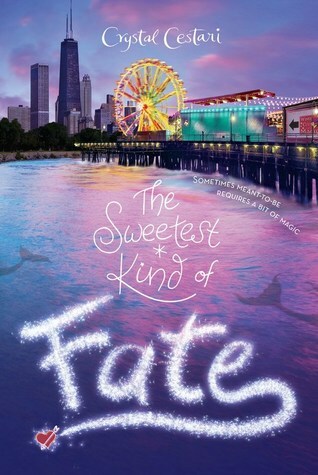 THE SWEETEST KIND OF FATE is the second book in the Windy City Magic series, and we're excited to have Crystal Cestari with us to share more about it. Crystal, what is your favorite thing about THE SWEETEST KIND OF FATE? In this follow up to The Best Kind of Magic, I really like how The Sweetest Kind of Fate pushes Amber to grow and find new depths within her worldviews. She is not a perfect person; she makes snap judgments and mistakes just like anyone else, but she’s also not afraid to admit when she’s wrong, and I like when characters are able to stand up and change when challenged. I was happy with her evolution and how she comes out even stronger by the end. Also, mermaids! From the very start, I had a visual of two mermaids swimming together in love, and I was so excited to incorporate this lovely couple into the heart of this story. What was your inspiration for writing THE SWEETEST KIND OF FATE? This story is the sequel to my first book, The Best Kind of Magic, and I was inspired to continue my matchmaker heroine’s story! Amber has a very special place in my heart, and I was so happy to spend more time with her unique voice and worldview. This was the first book I wrote under contract, so the experience taught me I could write on a deadline! It was a new kind of pressure—having to be creative under the clock—but it pushed me to trust my instincts and not give up. I’ve been writing all my life, but The Best Kind of Magic was my first book that truly lit a fire under me and inspired me to go for publication. It took a lot of research and time to figure out what I needed to do, probably just as long as it took me to write the book. The experience is definitely not for the faint of heart, but I was so excited about my story, I knew I had to try. I’m kind of all over the place when it comes to my writing time: sometimes I’m in public listening to music on my headphones, other times I’m at home in complete silence. I’ve written while on buses, trains, or even the checkout line at Target! Probably my biggest writing quirk is that I hand write all my first drafts in notebooks; it takes forever, and is super inefficient, but putting pen to paper before I bust out my laptop always nets better results for some reason. Be gentle to yourself when you’re writing a first draft. There isn’t a single book in publication that got it perfect on the first try. Editing is normal and necessary, and will make your story stronger as you go. The important thing is to keep writing and know you can always make changes! GREAT. I've somehow found myself tangled up with a siren, a mermaid, and a homicidal wicked witch who once tried to strangle me to death. Way to go, Amber! Amber Sand, legendary matchmaker, couldn't be more surprised when her archnemesis, Ivy, asks for her help. Ivy's sister, Iris, is getting married, and Ivy wants to prove her sister is making a huge mistake. But as Amber looks into Iris's eyes, there doesn't seem to be a problem-Iris has clearly found her match. It seems happily-ever-after is in the cards, but when Iris seeks out a dangerous, life-altering spell, it's up to Amber and Ivy to set aside their rivalry and save the day. As Iris puts everything on the line for love, Amber continues to wrestle with her own romantic future. Her boyfriend, Charlie, is still destined for another, and no matter how hard she clings to him, fear over their inevitable breakup shakes her belief system to the core. Because the Fates are never wrong-right? Crystal Cestari lives just outside Chicago with her daughter. Her hobbies include avoiding broccoli and wandering the aisles at Target. 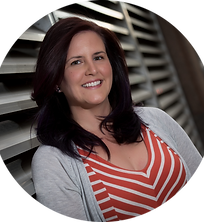 She holds a master's degree in mass communication, and writes all her stories longhand. She is also the author of the first book in the Windy City Magic series, The Best Kind of Magic. Visit Crystal at www.crystalcestari.com and on Twitter @crystalcestari. Have you had a chance to read THE SWEETEST KIND OF FATE yet? What's the strangest place you've ever written? Are you gentle with yourself while writing a first draft? Share your thoughts about the interview in the comments! This cover catches my eye every time. Need to put this on my summer TBR. Congratulations to Crystal on her new book. I hope Amber escapes that wicked witch!